Path of Exile update 3.0.1b for Xbox One will roll out later today. However, the official patch notes are now available. According to the latest Path of Exile patch notes, the update adds a plethora of new features, bug fixes and improvements to the game. The new update has added the Portent and Harbinger supporter packs. In addition, you will now move shorter distances if you only partially move the control stick in a direction. Check out full changelog below. Updated the Currency Stash Tab to include new slots for new currencies. Slots have been added for Orbs of Annulment, Annulment Shards, Chaos Shards, Regal Shards, Exalted Shards and Mirror Shards. Added a greater degree of control to movement. You will now move shorter distances if you only partially move the control stick in a direction. Updated the look of the Passive Skill Tree cursor. Added the Portent and Harbinger supporter packs. Various improvements have been made to world areas, including the Ossuary and Highgate. A larger set of improvements will be coming in a later patch. ‘Abandon Mission’ will no longer be highlighted by default when accepting a Masters mission. Added controls information to the Trade Market screen. Path of Exile update 3.0.1b for Xbox One has added the ability to rearrange your stash tabs. Press LB or RB to move your current tab left or right respectively. Path of Exile 3.0.1b has added a range of new item filters as designed by community member Neversink. Added the ability to display server messages such as countdowns to server restarts. You can no longer rebind skills while viewing the Help Panel. Hideout decorations are now placed in front of the player when used. Added error messages to the map device. The Challenge Panel now displays the number of challenges you have completed. Seeking a new prophecy now correctly highlights the new one. Other inputs will now be ignored while resizing the user interface. Path of Exile 3.0.1b has updated the controls that are displayed while in the Options menu. Updated the controls that are displayed while viewing a Premium stash tab. Updated the controls that are displayed while viewing an Essence stash tab. Updated the controls that are displayed while using the Map Device. Updated the controls that are displayed while using the Trade Market. Added a display for the controls available while navigating the Cosmetics panel. Path of Exile update 3.0.1b for Xbox One has added controls information to the Help Panel screen. You must now activate the Labyrinth device with A (rather than with X). Updated Tasuni’s Divination Card user interface. You can no longer change between panels while in Socketing Mode on an item. Lore text no longer overlaps with the control display at the bottom of the screen. Added filter options for the Divination Card stash tab. Added the option to move directly to the Cosmetics panel from the Shop screen. Path of Exile update 3.0.1b for Xbox One has added the ability to navigate the Cosmetics and Inventory panels using the D-Pad. Currency items are now prioritised while looting. Updated the Russian and Brazillian Portuguese localisations. Unique Fragments now follow the “Map to Maker” rule for allocation. Path of Exile 3.0.1b has updated class portraits for the Scion and the Ascendant classes. Harbingers now drop fewer stacks of currency shards, but these shards have reliably higher stack counts. This results in a higher total number of currency shards than before. Harbingers now appear more frequently in Map areas. More powerful Harbingers now appear more frequently. The volume of shards they drop has been increased, and they are also better dressed. You now need to complete 50 Harbinger End-game maps to complete the “End Game Grind” challenge (down from 100). Minions spawned by Harbingers were granted a resistance to all damage types that decayed over time. This is now multiplicative with other forms of damage taken. This change means that they can’t be trivialised by Wither, Shock and other modifiers to damage taken. Harbingers are now less likely to enter a state where they don’t summon new monsters. The Harbinger Flame Dash ability now Flame Dashes its minions to your location. The Harbinger Storm Call-like ability now attaches to the minions, moving with them. The Harbinger Flameblast ability is now stronger but used less often. The Harbinger Storm Cascade ability no longer stops at the Harbinger’s minion’s location. Instead, it will pass through, making it much more deadly for characters at a distance. Path of Exile update 3.0.1b for Xbox One has added several new abilities for the Harbingers to use. Be careful! The Harbingers from Act 6 onwards now have a chance to spawn an Obelisk when they summon monsters. These obelisks have a variety of skills. Increased the speed of most Harbinger encounters. Path of Exile update 3.0.1b for Xbox One has increased the speed that Harbingers can deploy minions. We’re also slightly increasing the number of shards dropped by Harbingers. Reduced the chance of getting lower-value shards from Harbinger drops in yellow- and red-tier maps. The chance of The Beachhead map being created by a Harbinger’s Orb has been increased. The Beachhead map now has a wider variety of monsters. Monsters slain as part of the Beachhead portal encounter now don’t drop items, but still award experience. Upon completing The Beachhead portal encounter, the Obelisks now will shatter and drop shards. Completing the encounter awards significantly more items. 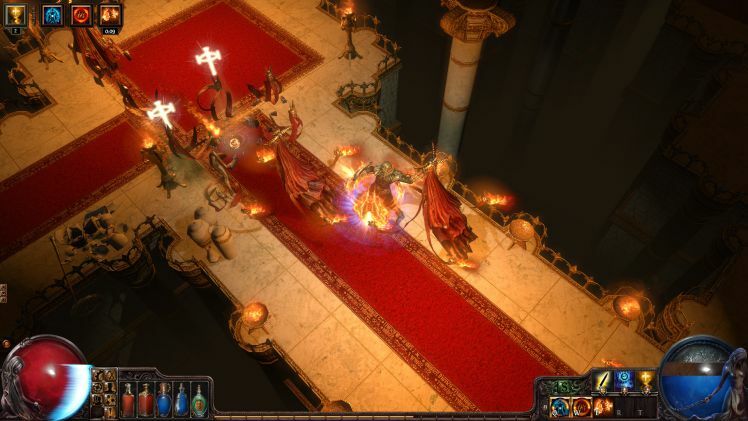 With Path of Exile 3.0.1b, the encounter itself has been rebalanced, and players now have to defeat an especially powerful Harbinger as part of it. Monsters in The Beachhead now will drop items, so that players using Animate Weapon can replace their minions. Currency Shards from The Beachhead final encounter now have more concentrated stacks. Harbingers in The Beachhead now drop more white items. Path of Exile update 3.0.1b for Xbox One has reduced the distance at which enemies are targeted. This will prevent targeting enemies that are not on the screen, but will not affect most skills. The damage levels of Righteous Fire when used by monsters and rogue exiles have been reduced. The damage of Spectral Throw as used by Templars in The Ravaged Square has been reduced. Charged Dash has been corrected to have its intended scaling. It now scales up by +1% base damage each level, starting at 90% of base damage. The Ravaged Square now has fewer Heretical Wards. Path of Exile update 3.0.1b for Xbox One has reduced the damage of the boss of the Death and Taxes unique map. Predatory Scorpions now use their burrow attack less frequently. Lunar Devotees now only summon one Ice Elemental at a time, but these are now tougher and do a more powerful explosion on death. Path of Exile 3.0.1b has fixed a bug where items were highlighting incorrectly in the Quad stash tab. Fixed a bug which could cause you to disconnect when trying to invite users who had the game suspended. Fixed various issues with the challenges screen and controls within that screen. Fixed a bug that prevented changing Ascendancies, even when you had no Ascendancy points allocated. Fixed various issues with the Pantheon screen. Path of Exile update 3.0.1b for Xbox One has fixed a bug where the Trade Market was incorrectly named. Fixed a bug where you would automatically target pets while in edit mode in your hideout. Fixed a bug which prevented Shockwave Totem from being placed on your target’s location. Fixed a bug that prevented you from closing the error message while using the Labyrinth activation device. Fixed a bug which prevented Diamond Flasks being searchable on the Trade Market. Fixed a bug where displayed controls would overlap the stash tab numbers when you had a lot of tabs. Fixed a crash that would occur while entering a certain Vaal side area. Fixed numerous issues with the Divination Card tab user interface. Fixed a bug that could prevent you from selecting certain points in the Ascendant’s Ascendancy tree. Path of Exile update 3.0.1b for Xbox One has fixed a bug that prevented loot allocation options from working. Path of Exile 3.0.1b has fixed a bug which could cause players to get stuck in Socketing Mode while viewing their items. Fixed a bug where the incorrect controls could be displayed while in Socketing Mode on an item. Removed an unnecessary icon from the World Panel. Fixed a bug where the slider would start near the bottom when viewing the Microtransaction Shop. Fixed the incorrect controls being displayed on the Prophecy screen. Fixed various issues with the Cosmetics panel. Path of Exile update 3.0.1b for Xbox One has fixed a bug which prevented the scroll bar from working when pricing an item in a premium tab. Path of Exile 3.0.1b has fixed a bug where the Prophecy panel and sell panel could incorrectly be displayed at the same time. Fixed a bug which caused inventory navigation to target the incorrect item slot. Fixed a bug where taking currency off the Trade Market could result in larger-than-allowed stack sizes. Fixed a crash that could occur from using Blade Vortex. Fixed a crash that could occur from corrupting the unique belt Auxium. Fixed a crash that would occur if the ‘Purchase Decorations’ option on a Master was empty. Fixed a bug where you could incorrectly skip rows while navigating the Cosmetics tab. Fixed a bug where purchased cosmetics weren’t being redeemed. Fixed a bug which prevented Premium stash tabs from correctly saving their settings. Fixed a bug which prevented user options from correctly saving. Fixed a bug which would cause the item highlight from appearing off-centre while highlighting some equipped weapons. Fixed a crash that could occur while resizing the user interface. Fixed a bug where Scorching Ray could behave incorrectly while rotating. Fixed a bug where a player’s cursor would reset during a trade with another player if that other player changed their state of trade acceptance. Fixed a bug which hid items on your cursor when moving between menu panels. Fixed a bug which prevented abilities on ‘Y’ from being used near Essence monoliths. Fixed a bug where the ‘Upgrade’ option was available in the Essence tab for Essences which could not be upgraded. Path of Exile update 3.0.1b for Xbox One has fixed a bug which made navigating to a Quad stash tab difficult. Path of Exile 3.0.1b has fixed a bug which incorrectly listed Leaguestone as a category on the Trade Market. Fixed a bug which caused items on your cursor to be displayed while navigating the Passive Skill Tree. Fixed a crash that could occur while applying items (such as currency) multiple times. Fixed a bug with which would cause the scroll bar to be cut off while viewing the Microtransactions Shop. Fixed a crash caused by picking up an item from a Currency stash tab. Fixed a bug which would cause items to incorrectly display off-centre from the cursor. Fixed a bug where the unique jewel Corrupted Energy would cause you to take significantly more damage over time than you should have been. Path of Exile 3.0.1b has fixed a bug which would show tutorials even after a player had selected ‘skip all tutorials’. Fixed a crash that could occur during the tutorial if the player reached a low life threshold. Fixed a bug which would cause gems to be in the wrong place when moved into an inventory with a smaller grid size. Path of Exile update 3.0.1b for Xbox One has fixed a bug which prevented items from being moved to the map device. Path of Exile 3.0.1b has fixed a bug which could prevent the Sekhema Feather from dropping. Fixed a bug where the Kill Harbinger Map Boss challenge could not be completed. Fixed a bug where the Harbinger Flameblast ability was not playing audio. Fixed a bug where Nature’s Boon removed the Arcane Surge granted by The Rippling Thoughts. Fixed various bugs with Act 9 boss not showing skill effects after exiting and reentering their arena. Fixed a crash with the “Lost Maps” Prophecy. Fixed a bug where Harbinger monsters with the Inner Treasure mod would not drop a unique item. Path of Exile 3.0.1b has fixed a bug with the Pantheon powers for Soul of Solaris and Lunaris where bonuses to Physical Damage Reduction instead applied to Armour. Fixed various bugs with several skills that were preventing them from targeting Kitava. Fixed a bug where socketing Cast While Channelling Support in The Rippling Thoughts would prevent Storm Cascade from being cast. Fixed a bug where the Beachhead map could become impossible to complete. This would occur when the Harbinger portal would become possessed by a Tormented Spirit from the Possessed Foe Prophecy. This can no longer occur. Corrected a tile from the Mesa map that was too narrow for characters to pass through. Path of Exile update 3.0.1b for Xbox One has fixed a bug where The Beachhead map would not spawn Harbingers on non-Harbinger leagues. Fixed a bug that could cause disconnects when changing areas. Fixed some performance issues with Storm Call. Fixed a bug where the “A Whispered Prayer” Prophecy could not be completed. Fixed a bug where modifiers to Damage with Ailments on the tree that were conditional on wielding a one-handed or two-handed weapon were reversed, such that the two-handed ones were active when you had a one-handed weapon, and vice versa. Path of Exile 3.0.1b has fixed a bug where monsters going underground could become invincible. Fixed a bug where Ethereal Knives with the Ethereal Stars Effect microtransaction had a different behaviour than the skill without this effect. Fixed a bug where Elreon and Vagan would not grant the daily mission experience bonus. Fixed an issue with skill based challenges, where hits against totems and minions prevented getting the challenge. Fixed an issue where highlighting of map locations on the Atlas was incorrect. Fixed an issue with client freezes on the Colonnade and Vault maps. Fixed an issue where players could not complete the challenge for upgrading Aberrath’s Pantheon Power. Fixed several of the most common instance and client crashes. Fixed a bug where the Plaguemaw IV Prophecy could trigger anywhere. Path of Exile 3.0.1b has fixed a bug where the Harbinger Obelisks’ Hinder is not stopped by Allelopathy gloves. Removed unnecessary contextually displayed controls for various items, including maps, currency shards, fragments, and divination cards. The patch will be released on September 14th at 3pm (PDT). Check your game update and download the latest Path of Exile update 3.0.1b for Xbox One.